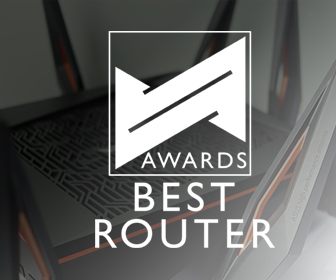 If you fancy looking for a new high-powered gaming router, there’s one that we can recommend and it might just be the most future proof one available in the market today. 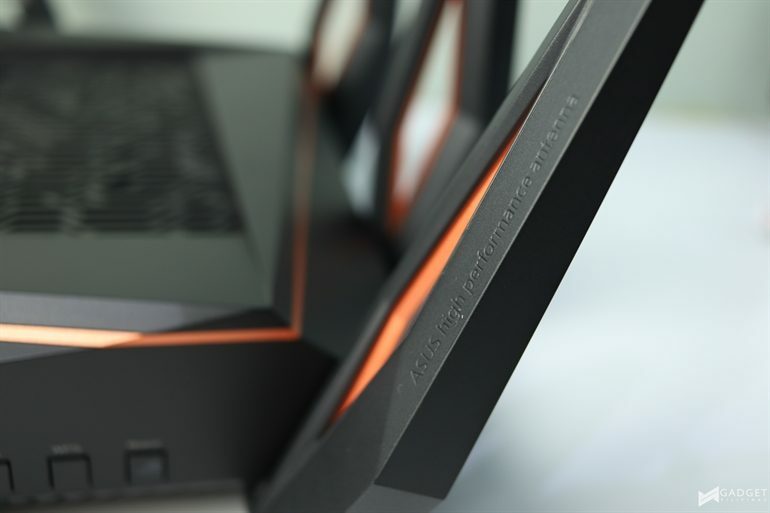 This is the ASUS ROG Rapture GT-AX11000, the first WiFi 6 IEEE 802.11ax router by ASUS and the first one launched in the Philippines by any consumer technology brand. 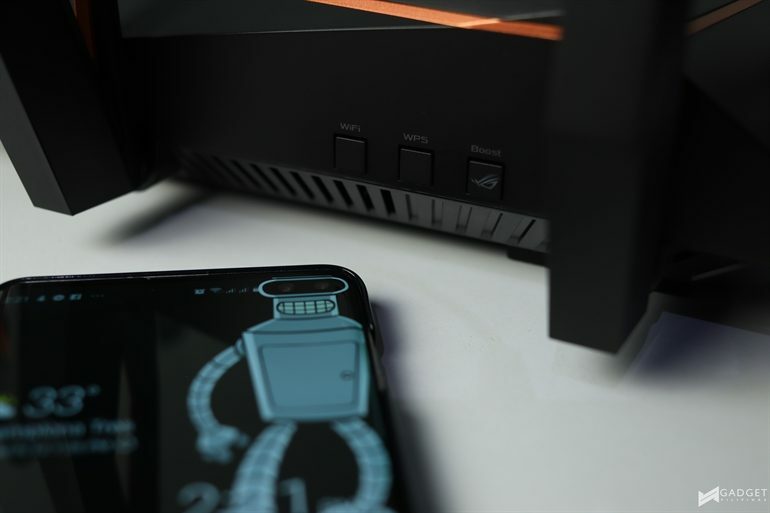 This isn’t your run-of-the-mill gaming router and never dare call it a minor upgrade to ROG Rapture GT-AC5300 as it stacks several new features apart from being an IEE 802.11ax certified router. Yes, the latter is a big deal and talk more about it later, but there are several upgrades under the hood that you should be aware of before buying one. Just so you know, vesting an award to a particular product is tricky. 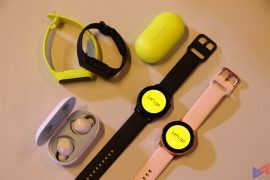 There are various reasons to consider on both technical and consumer side. 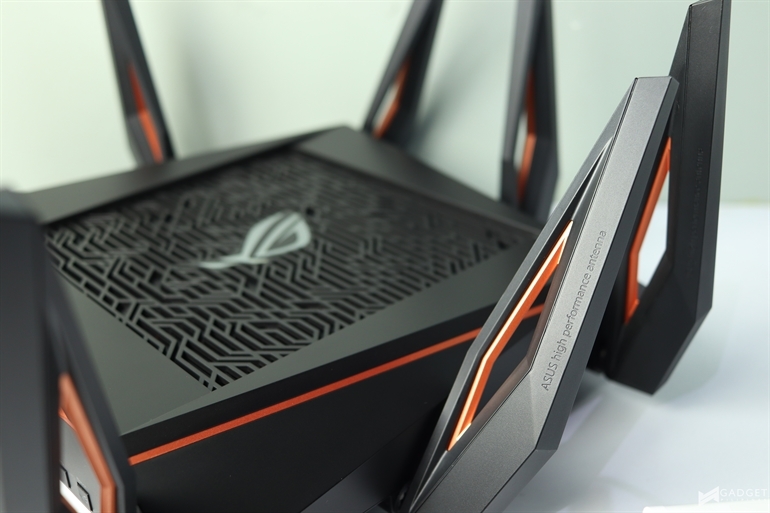 ASUS ROG Rapture GT-AX11000 isn’t cheap especially to someone who’s just after a router. 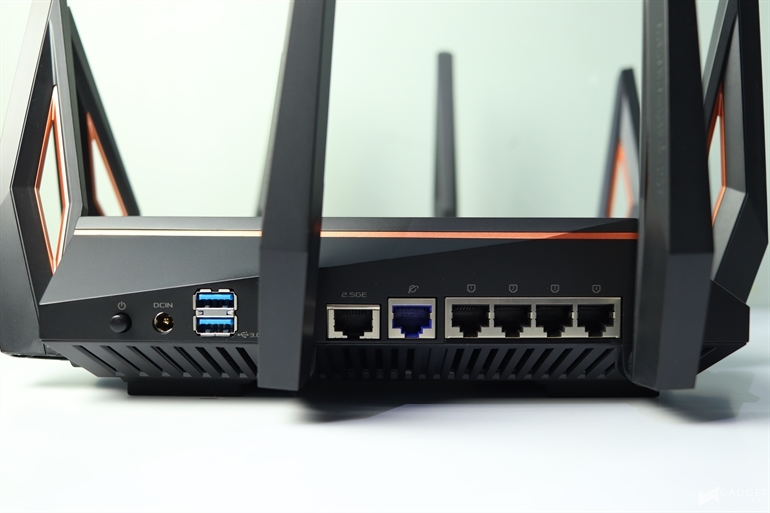 However, for someone who makes a living out of playing games or creating content, investing on a router like this should be top priority (apart from a reliable internet connection). Note that ASUS’ peripherals and PC parts side of the business does not advertise to Gadget Pilipinas as of this writing, so a pinch of thought of us being biased for giving an award should be out of the way. There are 3 things that you need to remember with ASUS ROG AX1100: 2.53x faster, 4x more capacity and 7x better battery life (for target wake time) for your smartphones. 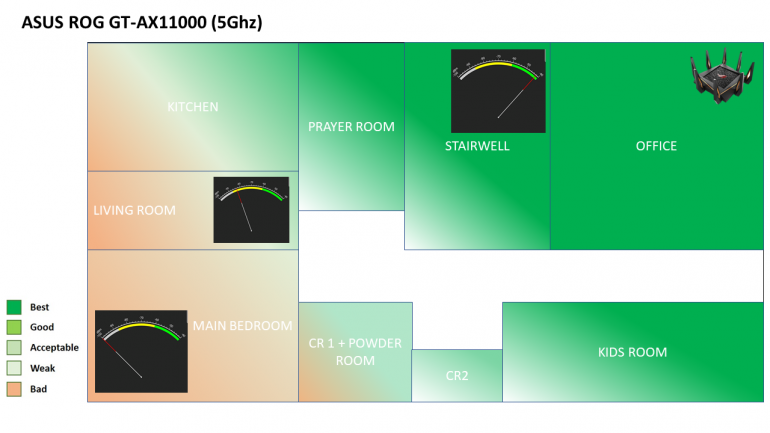 These new improvements over 802.11 ac and 802.11n give this latest router the maximum advantage, which you can fully enjoy. With new ways to play games and stream movies, it is for certain that the upcoming technologies will drastically change in the years to come. For instance, the requirement for the upcoming Google Stadia as revealed by Phil Harrison to Kotaku “that for games to be fully functional in 4K at 60 fps, a minimum connection speed of 30 Mbps is recommended. To enjoy buffer and lag-free 1080p games at 60 fps, a connection speed of 25 Mbps is considered optimal.” This speaks of a tall order to not just have a speedy internet connection, but it also demands a stable one anywhere at home. This kind of service, which will launch in the near future, puts ASUS latest router as the best available in the market right now. ASUS ROG Rapture GT-AX11000’s coverage is a huge upgrade from AC5300 based on our experience too. 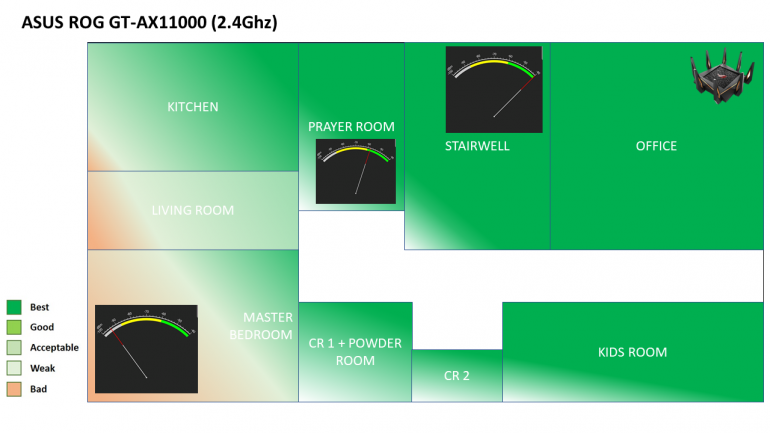 The router maximizes the internet throughput of our connection to its maximum up in various locations. As expected, the connection dips when we get too far from the router. As far as we’re aware, the only chipsets that include a WiFi 6 compatible chip are Snapdragon 855 and Exynos 9820. Not all phones support this, which gives the Galaxy S10 and S10+ the competitive advantage in the market that fully supports the newest wireless specification standard – WiFi 6. 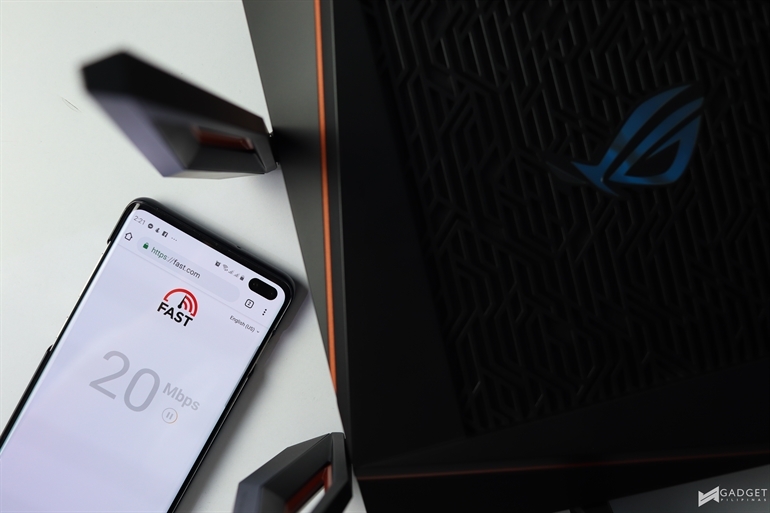 If you want to enjoy and maximize your Galaxy S10+’s high speed and wider frequency range WiFi 6, then you better check out ASUS ROG Rapture GT-AX11000 or its other latest AX-compatible routers. In the next few months, OnePlus 7 Pro, the new iPhone and the Galaxy Note 10 will be announced and are expected to support WiFi 6, and we expect the trend to carry on in 2020 when 5G will fully bloom. The list of games are expected to be populated regularly, and this feature allows you to OPEN NAT games, which makes connecting to game lobbies and communicating to friends to be much easier. There’s just too much to say about the ASUS ROG Rapture GT-AX11000, but a month of using the device, we can say that it deserves the award we’re giving it. The new router has everything we need to future proof and maximize our internet connection at home. Whether for work or for play, this new ROG Rapture has got you covered. Want to know more about this router? Check out our full video about it below.